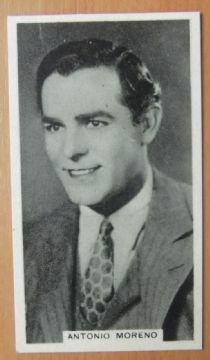 Original cigarette card issued by Godfrey Phillips showing Antonio Moreno. The card comes from the Cinema Stars set from 1930 and the set consisted of 30 cards. This is card number 14. The card is in VG-Fine condition, the corners and edges are still nice and sharp and the back of the card has his filmography up until 1929. It has the tiniest ( and i'm being really picky ) wear. Fine: A fantastic display piece. VG-Fine: A still for the most avid collector, may have tiny edge wear but still displays great. The card will be shipped very securely and placed in a jiffy bag to guarantee safe delivery. The more stills you buy the more money you save! * if you purchase a rolled item and a flat item this will incur Two shipping charges. If you buy 20 lobby cards you will pay one shipping charge at the shipping cost above, this is also the same if you buy 20 rolled posters.